The death toll from an Al Shabaab suicide car bombings at a Mogadishu hotels rose to 25 with 80 wounded, police said on Friday, as a gun battle raged at the site of the blast between fighters of the militant group and Somali troops. "So far we know 25 people mostly civilians died and 80 others injured. The militants are still fighting from inside a civilian house adjacent to the hotel... The death toll may rise," police Major Musa Ali said. The blast hit the Maka Al-Mukarama hotel on Thursday evening. 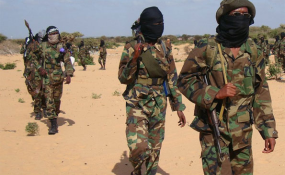 Al Shabaab claimed responsibility for the deadly car bombs in the capital.